A Pair Of 98-01 Acura Integra Halo Projector Headlights. The Projector Headlights Kits Provide For Intense Light Beam Concentration. Innovative & Unique Design That Customize Your Vehicle, With Only The Fraction Of Oem Headlights Cost. You May Also Upgrade The Light-Bulbs To High Intensity Discharge (Hid). The Headlights Is Securely Mounted By The Original Screws & Nuts Of The Oem Parts. If You Are Unsure About Installing Automotive Accessories By Yourself We Recommend Consulting A Body Shop. 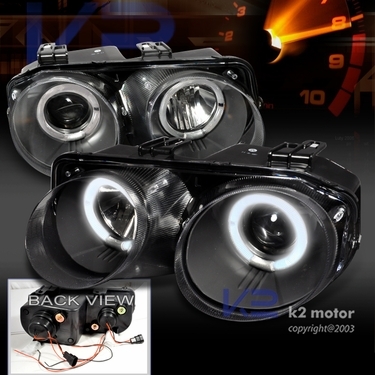 1998-2001 Acura Integra Blue Halo Projector Headlights - Black The Projector Headlights Kits Provide For Intense Light Beam Concentration. Innovative & Unique Design That Customize Your Vehicle, With Only The Fraction Of Oem Headlights Cost. You May Also Upgrade The Light-Bulbs To High Intensity Discharge (HID). These Headlights are Made for Direct Replacement. Professional Installation Recommended. Fits: 1998-2001 Acura Integra. Some modification required during installation. Made By Approved And Certified Manufacturer To Ensure Quality & Fitment.